The FliPak family offers multiple container sizes with attached hinged covers that prevent expensive loss of product . These plastic containers stack when closed or nest when open to provide the most efficient use of available space on the manufacturing floor, in the warehouse, inside a truck trailer or in the back room of your retail outlet. 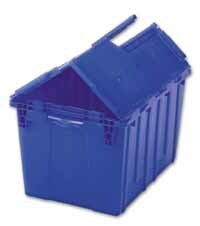 Returnable and reusable for over 250 trips, FliPak containers provide an excellent return on investment . Markets include health and beauty aides, pharmaceuticals, general merchandise, soft goods, fasteners ,jewelry, office products, tapes and CD’s, automotive parts , tobacco product and packaged grocery items. 1/4" or 3/8" diameter reinforced security holes are compatible with a variety of tote closures, from ties to padlocks. Traction-ActionTM material available for improved impact resistance and conveyability. Heavily reinforced hinge elements reduce breakage and cracking. Pebble-grain bottom surface provides excellent conveyor traction. Visible area above nest stops for easy reading of sequential number when nested or stacked. Quick - release label area on attached hinged cover and ends for easy reading and quick label exchange. Cover recessed within the perimeter of container to protect against c over breakage while conveyed or shipped.